Yummy Market's chefs are adding a new dish to the existing 850 home-quality recipes every week, which means there is always something new for the dinner table! Offering a perfect combination of variety and quality has made the European grocer - and its extensive prepared food counter - a must-experience culinary destination for European cuisine. A recent survey by Chicago-based food industry consulting firm Technomic found that Canadian consumers increasingly believe prepared food sold at grocery retailers to be fresher and overall a better value than dishes sold at fast-food restaurants. Not surprisingly, this is a trend Yummy Market's founders, Alexei and Anna Tsvetkov, have been observing since the first store opened in 2002. Over 10 years ago, the founders had successfully identified and filled a need for fresh, home-quality, ready-to-eat dishes among working families in Toronto's North York community. The trend has been gaining momentum since then. 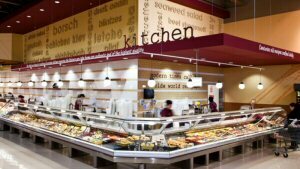 The grocer's prepared food offerings - and its customers' appetites for fresh, home-quality dishes - have been growing rapidly. So much so, in fact, that some customers, such as Brampton resident Yuriy Dzyubenko, drive over 50 kilometers one way on a weekly basis for a European food experience. So, what exactly is that food experience? Yummy Market's prepared food counter is not a typical grocery store's hot table - it's much more than rotisserie chicken, pizza, wraps and sandwiches. The grocer's Kitchen rivals a gourmet restaurant in variety, quality, production and preparation techniques. Over 40 in-store chefs, trained in traditional European kitchens, prepare hundreds of restaurant-worthy dishes from scratch on any given day. Home-style sausages, hearty soups, unexpected salad combinations, sweet and savoury pies and strudels, meat and seafood croquettes, dinner sides, piquant sauces, and many other culinary creations, satisfy cravings for new and familiar tastes daily. Busy working families and curious foodies, often after visiting only once, trust Yummy Market to feed their appetites for fresh, home-quality food. "Both my husband and I love the feeling of home cooking that Yummy gives us," said Jessika Morelli, a Yummy Market customer. With more Torontonians discovering a European food experience each day, the word gets around. Many now call Yummy Market their "new favourite destination for European delicacies." Focusing on quality and innovation has been a winning strategy for Yummy Market for over ten years and the trend is projected to continue. "Innovating and conveying quality will be key in differentiating," said Kelly Weikel, Technomic director of consumer insights, in a press release announcing the conclusions of the survey. "Retailers that deliver on freshness and uniqueness while providing an appealing experience will be most likely to succeed in gaining share of stomach." "Between long days at work, managing household chores and checking children's homework, many Torontonians don't have time to cook a proper meal," said Alexei Tsvetkov, CEO of Yummy Market. "We will continue expanding our prepared food menu to meet the growing demand for quality ready-to-eat food and new taste experiences." Yummy Market was founded by a European family in 2002 to fill a need for the growing number of Europeans living in the area, as well as the adventurous types seeking new food experiences. The founders immigrated to Canada from Moscow with a clear mission - they wanted to bring a European food experience to as many people as possible in their new Canadian home. The result of their commitment is evident today - Yummy Market offers a broad selection of European foods including hot prepared meals as well as fresh-baked breads, buns, cakes and pastries. The chefs at Yummy Market are trained in traditional European kitchens, ensuring the flavours you bring home from Yummy will take your taste buds back on a Continental tour of old favourites and new. Yummy Market now offers two convenient locations: 1390 Major Mackenzie Dr. W., in Vaughan and 4400 Dufferin Street in North York. Our staff speaks a variety of languages including English, Russian, Ukrainian, Polish, Farsi, Hebrew, Italian and other languages. For more information, visit www.yummymarket.com or visit our Facebook, Twitter, YouTube, Pinterest or LinkedIn. The extensive prepared food counter at Yummy Market located at 1390 Major Mackenzie Dr. West in Maple, Ontario.